The Milwaukee Bucks will move into a new $US524 million arena next fall that they hope will help usher in a new chapter for the franchise. With the move comes added pressure to win over fans and build a championship-contending team. The Bucks have already swung a big trade this year and may look for more in hopes of taking the next step. In the fall of 2018, the Milwaukee Bucks will move into a new $US524 million arena in the city’s downtown – a glassy, tastefully designed building that’s part of an entertainment block with shops, restaurants, a beer garden, and residential space. Team officials are excited for the building and the economic benefits they say will come with this new space. But with such an investment – $US250 million of which will come from taxpayers, not including interest – comes additional pressure to enter that building as a good team. The Bucks are one of the NBA’s rising teams, fresh off a 42-40 season and playoff appearance that caught many by surprise. Now the goal is to continue building, to make the playoffs for consecutive years for the first time since 2004. “I think there’s always pressure to win,” Bucks GM Jon Horst told Business Insider. Horst, who was promoted to GM this past offseason, said the team’s benchmarks for improvement won’t necessarily be measured in wins and losses – he hopes to see internal development in skills and culture. Still, in November, the Bucks swung a trade for point guard Eric Bledsoe, adding a young, dynamic guard who represents a skill upgrade at the position. The Bucks, with their young team filled with long, multi-position players, were clearly looking to win more games this season. “100%” Bucks president Peter Feigin told Business Insider of how much the new arena weighs into a decision to make a win-now move. Horst, despite saying he doesn’t want to measure improvement in linear terms, also admitted he would like the team to make the playoffs and advance to the second round of the playoffs for the first time since 2001. It all begins with Giannis. Streeter Lecka/GettyGiannis Antetokounmpo has become a superstar in a short time. Giannis Antetokounmpo’s impact on the Bucks is felt in many ways. The 23-year-old positionless Greek monster has become a top-10 player and MVP candidate and seems to still be improving. Feigin said Antetokounmpo’s rise over the past 12 months has been so great that it caught some Bucks staffers off-guard. 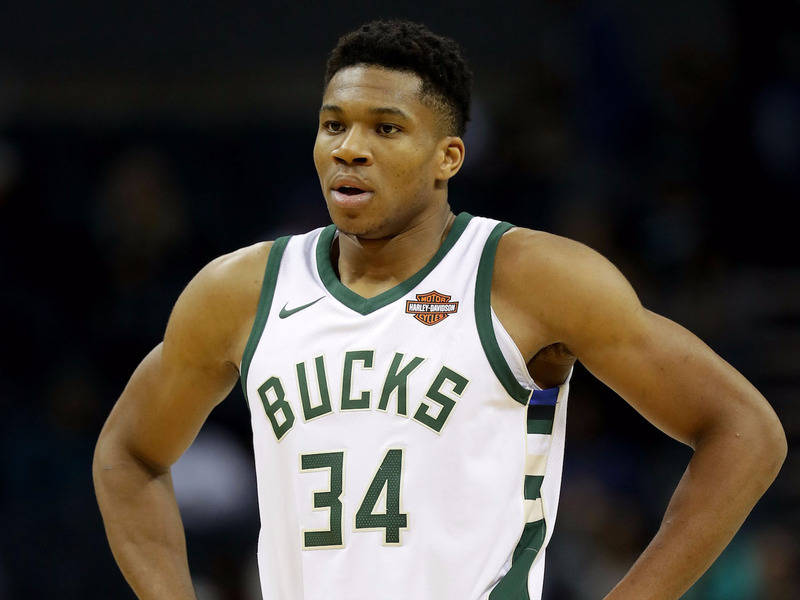 Now in the first year of a four-year, $US100 million contract extension, the Bucks are building around their franchise player. Antetokounmpo serves as the face of the franchise, a star capable of attracting fans and future free agents. Horst said that free agents want to play with great players like Antetokounmpo. He’s hoping the team’s new facilities are the second part of that equation. The Bucks believe there’s real basketball value in having a new arena and new facilities. This past year, the team opened the Froedtert & the Medical College of Wisconsin Sports Science Center, a multi-level, amenity-filled training center located across the street from the incoming arena. The Bucks hope all of this – the superstar, the rising team, the new facilities, the entertainment block – change the perception of Milwaukee around the league. That a traditionally small-market team that’s struggled to attract big free agents can become a free-agent destination. A championship-contending team that attracts top talent would ease some of the pain that came with getting the arena deal done. In July of 2015, Wisconsin approved the public financing for the Bucks’ new arena. The vote was controversial, as is often the case when taxpayers help pay for a new arena, with opponents saying the economic benefits of professional sports arenas are overstated. Not to mention the estimated $US4 billion net worth of controlling owners Marc Lasry and Wes Edens (per Forbes). Feigin, however, disagrees with the studies that have argued against publicly funded arenas. Feigin said the Bucks did not want to build an “island” like past teams have – an arena or stadium somewhere off a highway that offered little for fans to do otherwise. Those “islands,” Feigin said, are the source of the studies that say stadiums’ economic benefits are exaggerated. Feigin worked as vice president of marketing for Madison Square Garden from 1999 to 2004. He laughs at the contrast between Milwaukee and New York. This is one of the Bucks’ challenges. New York will always have Knicks fans, loyal, regardless of team success (which has arguably been less than what the Bucks have experienced over the past decade). In Milwaukee, the Bucks can’t just coast. “It’s really fan development 101,” Feigin said. The Bucks seek to create a winning team, a championship team with championship culture. They seek to win over fans with a great team and with a world-class arena. There are stakes, and it’s not guaranteed they will be successful. In June, ESPN’s Zach Lowe and Brian Windhorst reported that there had been some infighting amongst Bucks ownership about the direction of the team, particularly with the hiring of the next GM. They eventually agreed to promote Horst, though he was reportedly not the first choice. Horst and Feigin both say everyone is on the same page from the owners down to the coaches. They all have the same goals and the same ideas of how to accomplish those goals. But clearly this is a team with expectations, and those expectations are getting ramped up as they try to take the next step and open a new chapter in franchise history. The Bucks are on the clock.